(Beijing) — Lai Xiaomin rose to prominence by overseeing breathtaking growth at one of China’s “Big Four” distressed-asset managers. Now, his fall has exposed the murky entanglements of China Huarong Asset Management Co. Ltd., one of the “bad banks” established to clean up soured loans in the country’s banking industry. Emerging details about Lai’s tenure at the company paint a portrait of an ambitious official who leveraged his own personal connections and Huarong’s status as a government-backed financial giant to expand the company’s balance sheet sixfold over the last six years. The breakneck expansion allowed the company to quadruple its profits, but at the cost of making questionable investments that may have boosted the bad bank’s own bad assets. Lai, chairman and Communist Party chief of Huarong since 2012, has been placed under investigation on suspicion of “serious violation of party disciplines and law,” the Central Commission for Discipline Inspection (CCDI), the party’s corruption watchdog, said in a statement last week. The commission didn’t explain the reason for the investigation, but the phrase is often used to refer to corruption. 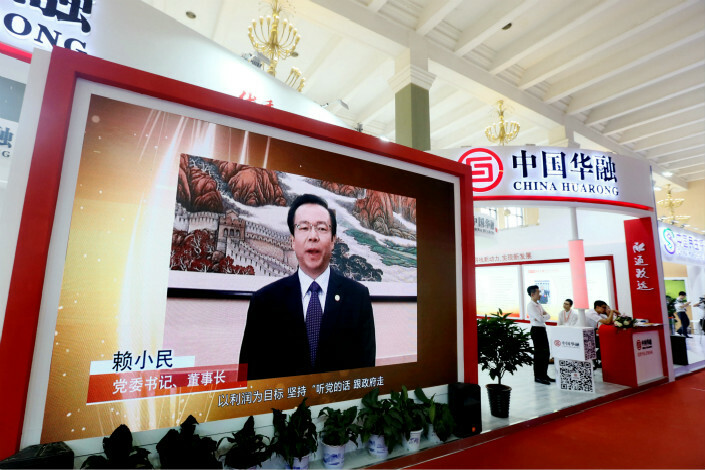 Caixin has learned that the CCDI is investigating Huarong’s involvement in an illicit financial backing of a private firm. The company was also involved in obscure business deals with embattled private conglomerates, including Tomorrow Holding Group and CEFC China Energy. Lai is the first senior executive at a state-owned financial giant to fall under investigation since the latest government overhaul further strengthened the CCDI’s power, signaling that regulators will continue to root out misconduct in the financial sector. Established in 1999, Huarong is one of the four national asset management companies created to dispose of the massive volume of nonperforming assets held by China’s big state banks. Their job is buy up distressed debt and try to recoup as much money as possible by selling or restructuring the assets or applying other methods of recovering the debt. During Lai’s tenure, Huarong underwent a radical transformation marked by a rapid expansion of its assets, liabilities and business scope. The company has grown into a financial holding group engaging in a wide range of financial services, including securities, trusts, banking and financial leasing. Since 2015, the company has also been investing overseas at an accelerated pace, acquiring more than 3 trillion yuan ($476 billion) in offshore assets. But Huarong’s risky business endeavors and ambiguous ties with private borrowers also sparked controversy. Rumors of an investigation into Lai have emerged over the past year. He was last seen in public on April 10, when he delivered a speech at the Boao Forum for Asia Annual Conference on the southern island province of Hainan. Caixin learned that Lai was asked to attend a meeting at the headquarters of the China Banking and Insurance Regulatory Commission (CBIRC) on Tuesday and was detained. Later that night, the CCDI announced it was investigating Lai. A number of Lai’s associates have since been placed under investigation, including Jia Tianjiang, chairman of Ningxia Tianyuan Manganese Industry Group — which has borrowed heavily from Huarong — as well as several executives of Huarong and its subsidiaries, Caixin has learned. All employees of Huarong and its subsidiaries were required to hand over their passports on Thursday so that they could not leave the country, sources close to the matter told Caixin. 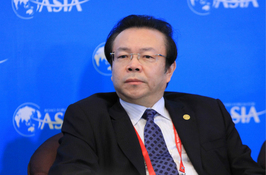 Lai, 56, was a veteran financial regulator before he joined Huarong in 2009. He was appointed the company’s chairman and party chief in 2012. His early career in officialdom looked promising. He spent more than a decade in the People’s Bank of China and became the vice director of the central bank’s credit management department in 1997 at the age of 35. In 2013, he became the first director of the Beijing branch of the newly established China Banking Regulatory Commission. In an earlier media interview, Lai said he had preferred a political career at the regulatory agency over heading what he described as a “marginalized” enterprise like Huarong. But now that he was at Huarong, he said he would “stay and enjoy it." People familiar with Lai described him as eloquent, bold and ambitious. Some also said he is boastful, aggressive and speculative when it comes to business. Lai was the public face of Huarong, but after his downfall, the company removed any Lai-connected reports and statements from its online platforms, Caixin has found. As the leader of China’s largest bad bank, Lai was a sought-after figure as he had enormous resources at his disposal because Huarong possessed the required business licenses to launch a wide range of financial services. In addition, its status as a central government-backed financial giant helped it get cheap credit from banks. During Lai’s tenure, he recruited and promoted many people from his hometown in China’s southern Jiangxi province and created a close network surrounding himself, sources close to Huarong said. During the investigation into Wang Baoan, a former vice minister of finance who was convicted of corruption last year, investigators found Wang had accepted more than 200,000 yuan in bribes from a Beijing businessman for arranging a meeting with Lai, according to case documents seen by Caixin. The numbers suggest that Huarong achieved remarkable growth during Lai’s time at its helm. The total value of Huarong’s assets grew from 309.3 billion yuan at the end of 2012 to 1.87 trillion yuan at the end of 2017 — a 505% increase — while net profit nearly quadrupled during the same period. However, during that period, the company’s leverage grew, with its debt-to-total assets ratio rising from 87.09% to 90.23%. Over the years, Huarong set up more than 1,300 affiliated companies with partners to raise money from bank loans or off-balance sheet lending channels — typically the wealth management funds managed by commercial banks — to invest in private equity, property and the stock market, according to business registration record provider Tianyancha. The company also raised over $20 billion over the past three years by issuing overseas bonds to fund risky investments, Caixin has found. With easy access to funding, Huarong has aggressively expanded by taking over bad assets regardless of the price, industry sources said. The company has also increasingly invested in property projects and real estate developers, as well as stocks in Hong Kong. Through various overseas-registered investment vehicles and shell companies, Huarong has invested over HK$10 billion ($1.27 billion) in Hong Kong’s stock market in recent years, Caixin’s study on market records showed. To expand its presence in the Hong Kong market, in 2014 and 2016, Huarong acquired two Hong Kong-listed shell companies — Simsen International Corp. and Chun Sing Engineering Holdings Ltd. Both companies were backed by controversial conglomerate Tomorrow Holding. Tomorrow’s founder, Xiao Jianhua, has been assisting authorities in unspecified investigations since January 2017. Another embattled conglomerate, CEFC China Energy, also obtained financial backing from Huarong in Hong Kong. Market documents showed that in December 2016, Huarong issued HK$600 million in loans to two CEFC China subsidiaries. And in December, Huarong bought a 36.2% stake in another CEFC China unit. A Huarong source said the 2017 equity investment was the disguise for a de facto lending agreement with CEFC China, a risky practice that has been targeted in the latest financial regulatory crackdown. CEFC China, a private energy giant, has been struggling with a capital crunch since its founder, Ye Jianming, fell under investigation. Investigators targeted Lai for Huarong’s controversial financial backing of Ningxia Tianyuan Manganese Industry Group, a privately owned, mysterious electrolytic manganese producer in Northwestern China’s Ningxia Hui autonomous region, Caixin learned from sources close to the matter. This financial backing allegedly served to cover up Huarong’s investment failures, sources said. Jia Tianjiang, chairman of Ningxia Tianyuan, was detained around the same time as Lai was, Caixin has learned. Established in 2003, Ningxia Tianyuan has been a target of the government’s campaign to cut industrial overcapacity and fight pollution. However, since 2014, the company has received consistent financial support from Huarong, allowing it to expand and undertake overseas acquisitions. Last year, for example, Huarong arranged a structured financing deal worth more than 20 billion yuan for Ningxia Tianyuan. About 10 of Huarong’s subsidiaries invested a combined 10 billion yuan in a junior tranche of capital, which had a higher risk profile because it would be the first to take losses if the investment soured. Several financial institution sources described Ningxia Tianyuan as a “zombie enterprise,” a term referring to companies with crushing debts but little profitable business. One bank executive said that while Ningxia Tianyuan had 50 billion yuan in total assets, its total liabilities are unknown. Its risk exposure to the manganese producer could be “tens of billions, or even hundreds of billions” of yuan, the executive said. According to business records and sources, Huarong and Ningxia Tianyuan hold stakes in each other’s subsidiaries through a complicated web of transactions. Lai put many of his close associates in Huarong in positions at Ningxia Tianyuan’s financial service subsidiaries and fed the companies with capital injections. In return, Ningxia Tianyuan acted in concert with Huarong to help cover up the latter company’s failed investments, Caixin learned from sources with knowledge. In March, a unit of Hong Kong-listed China HKBridge Holdings agreed to set up a 20 billion yuan fund with partners to help restructure debt-ridden real estate developer Zhonghong Zhuoye Group. Zhonghong, which has defaulted on its bonds several times in recent years, borrowed about 8 billion yuan from Huarong with little collateral. Business registration records showed that China HKBridge is 16.4% held by Ningxia Tianyuan. Meanwhile, China HKBridge is also a shareholder of several Huarong subsidiaries. In May 2017, Huarong set up two investment funds with China HKBridge worth HK$4 billion in total, with 78% of the funds coming from Huarong. Backed by Huarong’s capital, China HKBridge’s restructuring of Zhonghong was a maneuver aimed at covering up 8 billion yuan in Huarong’s bad assets, sources said.